So from the beginning of the 70s until his death, Jerry Garcia was an active participant (though not usually given his due) in to the "new grass" bluegrass revival scene. Most notable was his friendship with legendary mandolin player David Grisman. The two recorded many records together most of them striking a great calm balance between Grateful Dead and the bluegrass virtuosity that Rounder records was putting out at the time. This record, released in 1998 on Acoustic Disc is a collection of Miles Davis (and Milt Jackson) covers recorded in the early 90s. 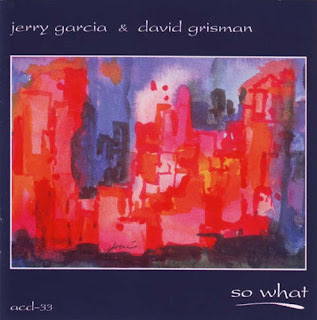 The disc actually has 3 different recordings of the classic "So What", two of "Bag's Groove" and "Milestones" and then right in the middle of the record is a Grisman original "16/16"
Though the record has little variety in the songs that are actually presented here, the musicianship and the unique takes on these familiar jazz tunes are perfect for fans of new grass and jazz equally. It's a really beautiful and enjoyable cd, with enough funk to get you nodding your head but enough relaxing strings to wake up with again and again. It is a great, unique recording and one of my favorites the duo put out.